First, let’s give the rotating chain wheel some consideration. When engaged, it’s like a swing ride where the chains are moving freely in the air, pointing radially from the chain wheel center because of the centrifugal forces. Then, all of sudden, the chain is trapped by the pincer of rubber and road surface – the front of the tyre’s footprint. It’s now the chain is doing its job by increasing the static friction between the rubber and the road’s icy surface. And, at the back part of the footprint, as the drive wheel is rolling, the chain will release and swing around to the front, again and again. To learn more, read the blog post "What is traction, friction and road grip?" If the chain wheel is moved forward, a longer part of the chain strand will end up under the tyre, thus increasing effectiveness. However, there’s a downside to this: A part of the chain will still be trapped under the tyre when the chain wheel is rotating trying to pull it free. The chain will be pulled out by force, putting excessive strain on the chain mounting. Furthermore, the chain end – that is released under tension from the tyre – may bend and hit the tyre side instead of ending up under the footprint, if it’s not completely stretched out. This will cause an unreliable and jerky operation, not to mention unnecessary wear on the tyre and road surface. Actually, this is the result of a chain wheel positioned too far to the front. By moving the chain wheel position back, the chains will release easily, resulting in a smooth and un-jerky operation. However, this comes at the price of reduced effectiveness since less chain would end up in the footprint. This is the result when the chain wheel is positioned too far to the rear. Obviously, we should find a compromise. Which is the ideal chain wheel position? To spin freely, the chain wheel should be positioned at the ideal height – 100 ±20 mm above the road surface. But, which is the ideal length-wise position for the chain wheel? Countless calculations and computer simulations have been made to find out, and a range of field tests have been carried out to prove right or wrong. From extensive research and development over the years we can conclude that the wheel axle centre line is the golden middle for positioning the Onspot chain wheel. When positioning the chain wheel exactly in the drive wheel axle centre line you get the optimal combination of effectiveness, reliability and comfortable operation. Plus, you have exactly the same function whether driving forward or reversing. Lars has been in the organization since 1988. He was involved in the transfer of the Onspot production from Linköping to Vänersborg (Sweden) in 1991/1992. He then worked with the Onspot brand till 2008 together with the R&D team. 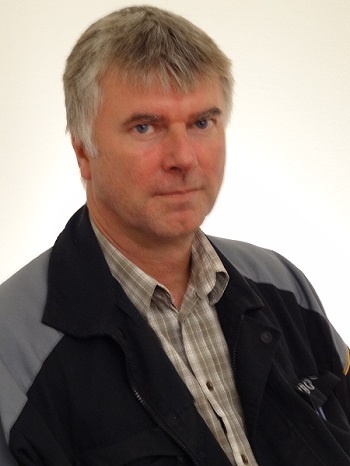 Since 2009 Lars is the Quality-/ Environmental Manager at the VBG Group Truck Equipment in Sweden, which includes the brand Onspot. When not working, he enjoys spending time with his family and in his summer house close to Vänersborg, Sweden.